Two things stick in my mind from my trip to Tuscany with regards Italian cooking. Firstly, don’t be scared of seasoning. The Tuscan food I ate was beautifully and heavily seasoned. I tend to err on the timid side when it comes to salting my dishes. Of course, you don’t want to go over the top, but adding a little and tasting and adding some more will help with this. I’ve been watching Master Chef this season and the chefs are constantly tasting what they are making as they go to check the flavours and seasoning. Secondly the Italians let the flavours speak for themselves. Few of the dishes were complicated, nor were the ingredients cooked for particularly long. The fresh, local ingredients spoke for themselves. I ordered bruscetta several times. Each time it was just two or three well seasoned, complimenting ingredients, rarely cooked, assembled on toasted bread. It was delicious. Here I’ve taken three simple ingredients orange, radish and fennel, thinly sliced and raw, and added just enough seasoning and complimentary dressings to really make them zing. This makes a delicious light lunch or would be a great vegetarian starter. I bought a really interesting salt at San Lorenzo food market in Florence. It’s called Sale Italiano et Vino Rosso- Italian salt and red wine. Personally I can’t taste the red wine in the salt, but it does lend it a delicate pink colour. I use it in salads and it’s interesting because some of the salt crystals are quite large. Whilst I crush the larger ones, I quite like having the larger pieces dotted through a salad. I used this to season the salad but Maldon salt will be just as good. 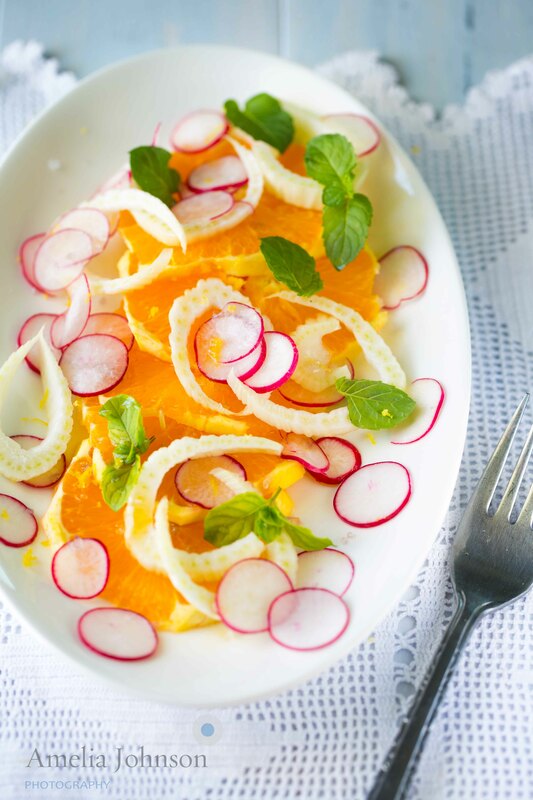 Assemble the orange, fennel and radish on a plate. Toss over lemon zest, sesame oil, mint and salt to taste. Serve immediately with fresh rosemary focaccia or other fresh bread. Optional: Add walnuts for some good oils/protein. I didn’t have any in the kitchen otherwise I would have done for some crunch. Pizzaro is a new local chain of restaurants here in the UAE. And boy do they know something about pizza. Italian Chef, Vicenzo is at the helm of this team, who knead and grate and chop all in the name of fresh, traditional Italian pizza. 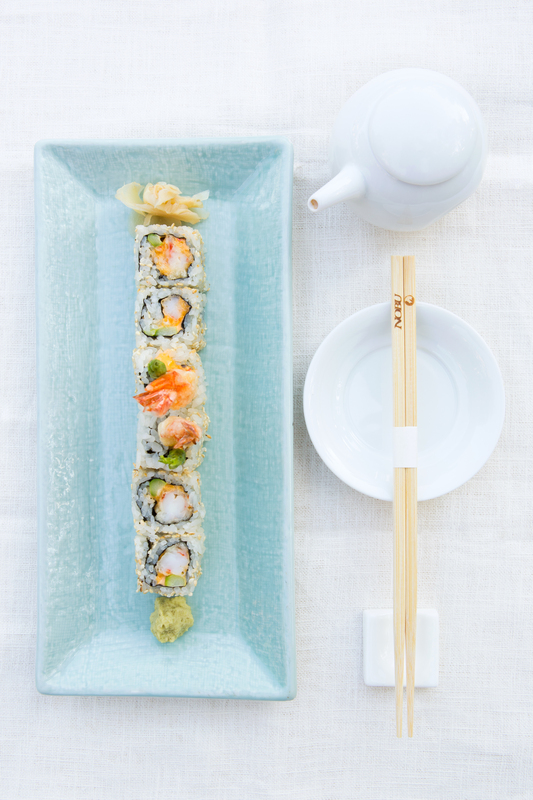 Last week I shot their take-away menu for 2013 with a great team. Can’t wait to see it pushed under our front door! Coming soon to a road near you… Pizzaro are planning on opening 15 new restaurants next year. We shot this tasty tasty vegetarian pizza and then I ordered it for lunch. The perks of being a Food Photog: getting to see all the dishes before I decide what to order!